Fun Games for reading and math readiness. Use the Free Printouts below! Memory and matching games are interesting for all ages. They help develop visual skills, spatial memory and recognition of shapes, sizes and objects. First introduce the game as a matching activity. You can start with 2 or 3 pairs of matching cards. Randomly lay out the cards face up. Show your toddler how to match each card. Take one card, put it in a row by itself and place the matching card next to it. Usually, your child will take over this activity. Add more cards to match until you child is satisfied. For older preschool children, just let them match the cards. Pairing the cards will help your child understand the game and what the cards look like. Flip up one card face up. Pick a second card and flip it up. See if it matches the first card. You can make the game easier by continuing to flip up cards until one matches. Take the matching pair of cards and put them next to your child. Put the rest of the game cards face down again and repeat the game. Try to remember the cards you have flipped over. Make sure to keep the cards in the same place in the layout. Eventually, you will take one turn flipping only two cards. Here is a online memory game that is played this way. If you match a pair, the player can take another turn. Your turn ends when you can't match your card. I like to play games in teams to make it more cooperative. This is a fun family activity. Use both printouts for a more challenging game. Spread the cards in a random pattern so they are not in a row. This makes the game more difficult. 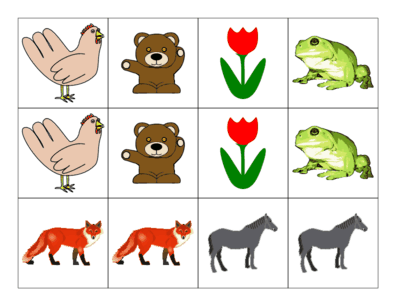 For older children you can use two decks of each printout to make a more challenging game. It may take a whole table to spread out the cards. This is a fun game for a family or a crowd of friends.